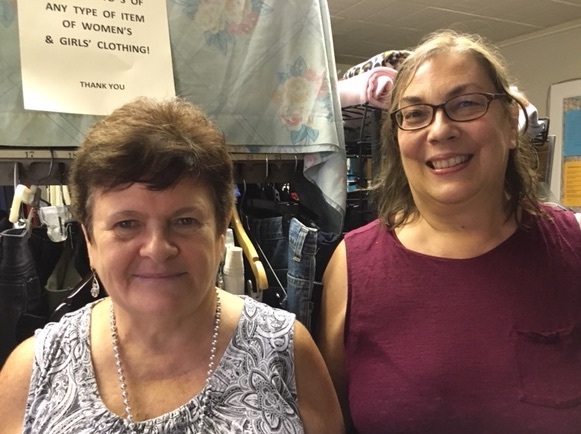 The Clothing Room at the Jenkintown UMC Food Cupboard has been reorganized and revitalized, thanks to the work of a dynamic duo of women who keep the operation humming. Karen Gradel-Klos and Mary Ann Hoyt, both of Jenkintown, serve as co-chairs of the food cupboard’s Clothing Committee. Each week, the food pantry, open on Thursdays from noon to 2 p.m., welcomes all Montgomery County residents in need of free food and clothing to its location in the lower level of the Jenkintown United Methodist Church. Patrons of the food cupboard earn clothing credits each time they shop in the food cupboard’s market room. After filling their shopping carts and putting the groceries in their cars, patrons are welcome to use the credits for free clothing for themselves or their families. On display in the Clothing Room are hundreds of items for men, women and children that have been donated by people in the community. “We accept clean, gently used, in-season clothing and shoes for all ages,” Karen said. About 25 to 30 food cupboard patrons visit the Clothing Room each week, she estimated. The items of clothing have been separated by gender and size and hung on racks or folded neatly into piles, thanks to Mary Ann’s handiwork. Mary Ann said she retired a year ago and was looking for a volunteer activity close to home when she signed on to the Clothing Room. Her rich talent for organizing things was swiftly put to good use. “You were a blessing then, and you’ve been a blessing ever since,” Karen said, noting that Mary Ann often comes in when the food cupboard is closed to sort and display the clothes. The Clothing Room also has gotten a big boost from the help of Lucy Serrano, who volunteers as often as her schedule permits. The women try to open the Clothing Room every week. It takes at least two of the volunteers to staff the 16-foot-square room. One person manages the paperwork while the other assists shoppers. Patrons can select from a broad assortment that includes shirts, pants, tops, skirts, shorts, purses, blouses, coats and shoes. The women have added a bit of fun to the experience, too, with what they call their weekly “Blue Light Specials.” These are miscellaneous items such as a coffee maker, beach towels and sheets, which are displayed on a table. Karen, who is excited about the room’s recent transformation, has been instrumental in keeping the Clothing Room open and a key feature of the food cupboard for the past five years. Why did she get involved? Want to donate clothes or have time to volunteer? The Clothing Room, located just inside the church’s Muriel Happich entrance on Summit Avenue, always is in need of men’s clothing and coats. On the Clothing Room’s door you’ll find instructions to leave gently used, in-season clothing in the blue plastic bin farther down the hallway. If you have any questions about donating clothing or volunteering to help out, please contact us at (215) 274-5720 (leave a voicemail) or by email at jenkintownfoodcupboard@gmail.com.